Gastric Sleeve Surgery in San Antonio success story John Newton. John spent many years making a great sacrifice for our country and protecting our freedom while he was in the Navy. While in the Navy he had a very strict daily workout regimen that kept him in shape and kept him from putting on weight no matter what he ate. When John left the Navy he weighed about 230lbs and by the time he had surgery in 2015 he weighed in at 338lbs. John was no stranger to the other options out there to assist in his weight loss, his mom had a Gastric Bypass and his sister had a lap band, so after thinking it over he finally decided to look into it. 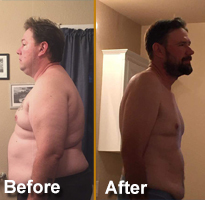 John began his journey with Texas Bariatric Specialists in June of 2015 and on September 28, 2015 and in just over a year John has lost over 140 lbs. 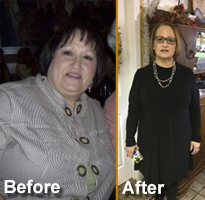 Mary, like so many others, has spent the majority of her life trying to lose weight. After Mary’s second pregnancy, she did not have the weight loss that she had after her first pregnancy and started seeing the weight come back on. Mary got the lap band and lost only 36 lbs. before she started experiencing complications. She ended up having a chronic slip and was never able to get it back to working properly for her. After five years of battling with the band, Mary decided there had to be another option, so she set out to find something better. Mary decided that Dr. Patel was the answer she needed. After meeting with Dr. Patel, he agreed to remove her band and do a RNY. So on December 28, 2015, that’s exactly what he did. Now, Mary is just a year out from surgery and has already lost almost 100lbs. Growing up Mary was always the chubby kid. She was taught by her grandmother, who survived the Great Depression, that she needed to clear her plate which played a large roll in her weight increasing throughout childhood. 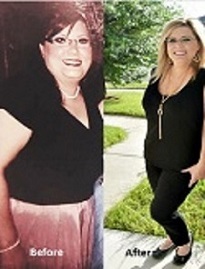 As an adult Mary tried everything and anything to lose weight but never had any luck so she stepped out of her comfort zone and started considering weight loss surgery. 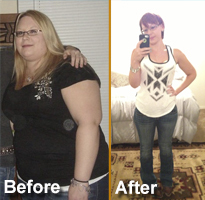 She had a Gastric Bypass on 1/23/12 and lost a total of 155 lbs. After multiple failed weight loss attempts over the years Isaac finally hit his limit at the end of 2015. “I could not walk, stand or carry my then 2 year old for more than five minutes!” He also became embarrassed that he was often told by people that he needed to stay home when they were going out because he wouldn’t be able to keep up with them. So on July 20, 2016 Isaac took the biggest step in his journey and went into surgery for the gastric bypass bariatric surgery in San Antonio, and in the last five months he has already seen a huge change. Buddy started experiencing health problems due to his weight when he was in his 40s, but that was after he had already spent most of his life overweight. He began dieting when he was in his teens and tried so many different diets and programs over the years in order to lose weight but was never successful long term. On February 5, 2014 Buddy changed his life forever and got the Roux-en-Y Gastric Bypass. He felt that with all he had tried and with his health concerns this was not only the best option, but for him, it was the only option. Buddy has definitely had his ups and downs, but even with his continued struggles, Buddy says that he would “ABSOLUTELY with no hesitation” do it all again. He would not change a thing and would not do anything but the bypass again. Mrs. Wilson, Jackie as she likes to be called, came to TBS in 2015 in hopes of having a revision of her Lap Band, which was not yielding any significant weight loss or changes of her co-morbid conditions. She had her Lap Band placed in 2010 and weighed 257 pounds. Jackie underwent a Laparoscopic Revision of her Lap Band and was successfully converted to a Roux-en-Y Gastric Bypass and since this time, her health has continued to improve and has done well enough to return back to the workforce in her chosen field of law enforcement. Growing up Alecia was never overweight! However, after having children and being a stay at home mom, Alecia, began gaining weight. She decided to change her life by seeing James at one of his seminars and never looked back! With bariatric surgery, Alecia has lost over one hundred pounds and is excited about staying healthy! When Wenona Parmer was growing up she was always the heavy kid. After a lifetime of ignoring her weight she decided to do something to change! Now that Wenona has gone through her gastric bypass surgery, she has lost thirty-three percent of her body weight and is looking to lose more!